The plan received four variances from the Zoning Board of Appeals and is on the agenda for Tuesday's Common Council Legislation Committee for another special permit for the project. On Monday, the city Planning Board was being asked for site plan approval. Nardin President Marsha Sullivan said she can't talk about the cost because it is part of a larger fund drive that has not been announced. The new gym would be elevated one story above ground to allow parking underneath on a campus which does not have much. Its cost will include being built on pilings. "We have to be responsible. These facilities are built with donor dollars as a private school's right, so the philanthropy to our school is important to be stewarded," said Sullivan. "So it will be well done. It will be built to support the programs that we care about so much and it will be done with fiscal responsibility." The all-girl private Catholic high school would like to have enough money in hand to start construction in the spring and finish for fall 2020. Nardin athletes now have to be bused across town to Villa Maria College for basketball and volleyball practices and games. Neighbor Jay Bangs said Nardin parking would be an increasing problem if games are played on Cleveland Avenue in the new gym instead of at Villa Maria. "It's highly posted. It's never regulated. When they have these events, the entire neighborhood is saturated with people parking in front of hydrants in complete disregard for the neighbors," Bangs said. "Now we're going to have 20 more events and then having told us how many more events than that, they have been quite cagey and quite silent and so it would be my opinion that this is going to have a long-lasting detrimental effect." Current parking is for teachers and staff, while students have to park on the streets. There are also school buses to the school and a lot of parents dropping off and picking up kids. "We are realistic about this process and, although I do realize the frustration of our neighbors, we are completely responsible to their needs," said Sullivan, "and if it takes another couple weeks to give them the trust and assurance that we are going to do what we say we are going to do, I'm happy to take that time." "The Cleveland side looks very nice. The facades - you've got them in your packet - pictures of the facades on Cleveland, they look very nice," Sack said. "The facades facing Auburn don't look so nice. Let's make Auburn side look just as nice as the Cleveland side." Several members of the Planning Board weren't happy with some of the design for the addition - not liking the use of metal panels. Architects say they have already made some design changes and are open to others. Ivo Margic supported the school. "We don't have public schools in the area, so I think it's really important that we support schools like this, help them grow and this is what you need to keep up with the other private schools in the area," Margic said. "As a former athlete, both college and high school, that 20 minutes doesn't sound a lot - and I say that when going on the bus - but that's a lot of time to have one-on-one interaction with their teachers after school." 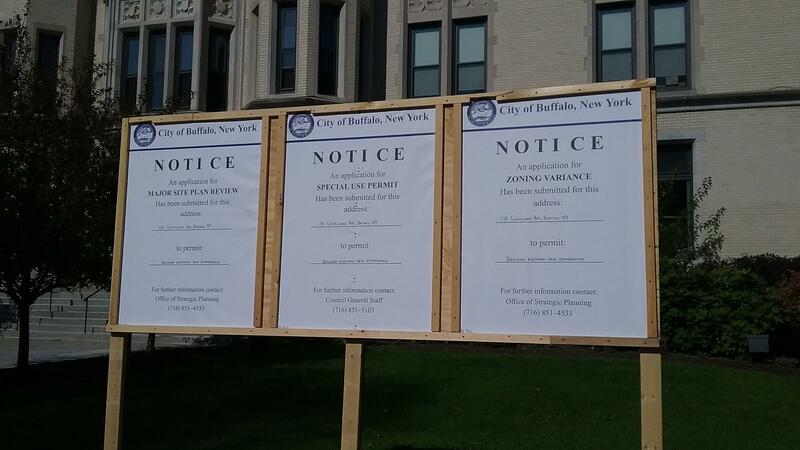 Buffalo's Zoning Board of Appeals holds a public hearing Wednesday to discuss the expansion of Nardin Academy.